Fireworks Linzer Cookies Recipe is a perfect 4th of July Dessert. 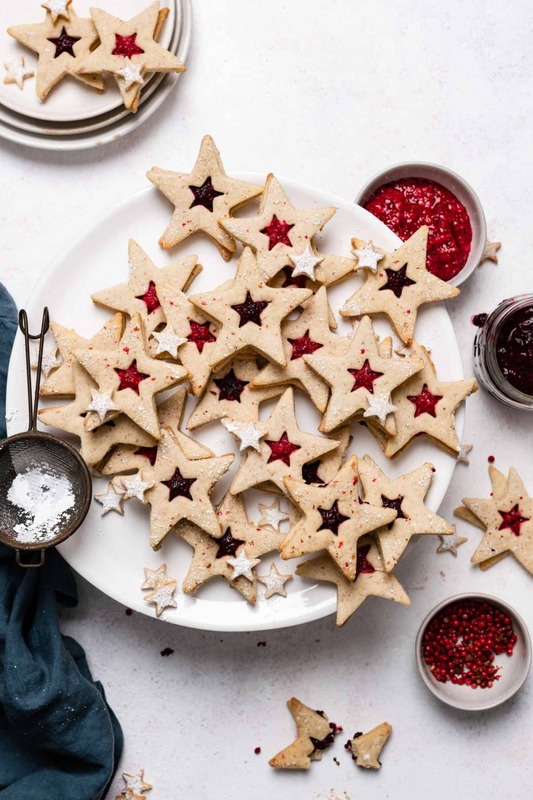 These easy cookies are filled with homemade fruit preserves and pink peppercorns. Once you eat a few, they will for sure make your yearly list for 4th of July desserts! 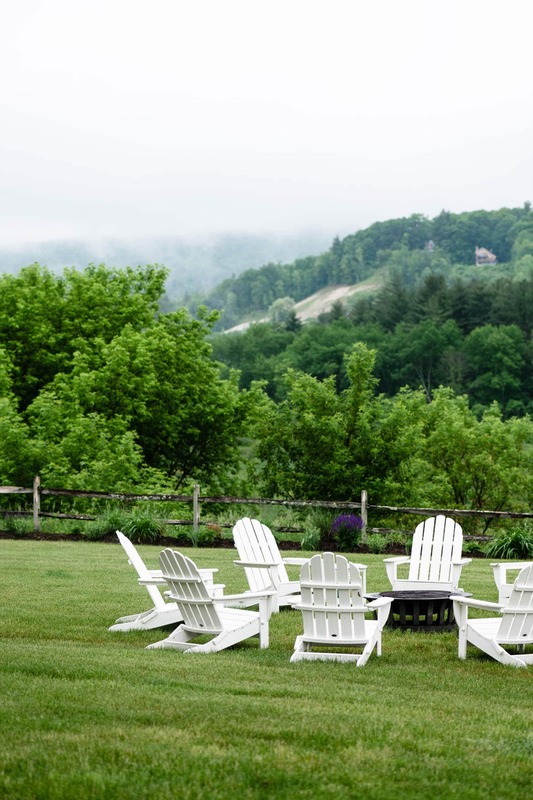 What’s you favorite part of celebrating the 4th of July?! Is it the hotdogs, burgers, homemade ice cream, or the fireworks? I would have to say all of the above, especially the fireworks! 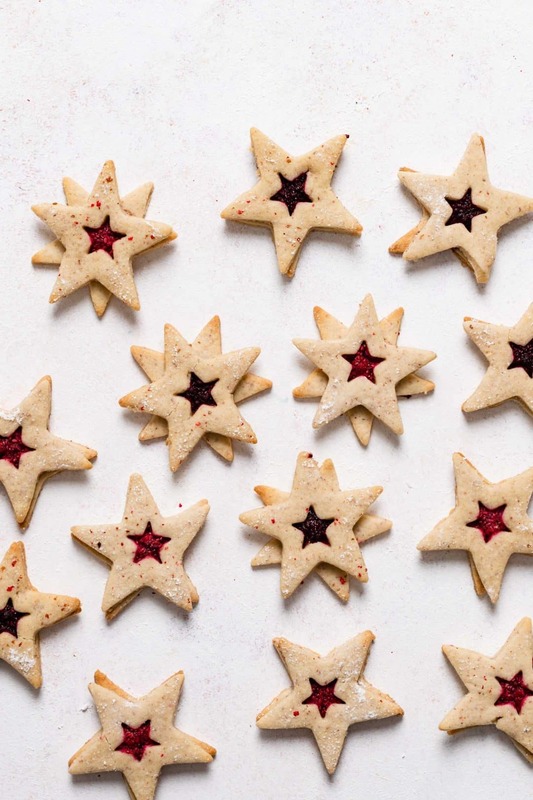 Hence the inspiration for this Firework Linzer Cookies Recipe. These cookies are super popular around Christmas, but everyone is making fresh fruit preserves this time of year. So naturally I want to do the same and eat them inside a delicious almond cookie. Southern women should all be experts at canning jams, jellies, and preserves. Realistically though, that can take some time! If I have a fruit filled cookie craving, I can’t wait overnight to satisfy it. Which is why this simple recipe for a combination of fruit jam and fruit preserve techniques works. Difference between Fruit Jam and Fruit Preserves? Fruit Jam is made by first chopping the fruit, then straining and removing the fruit chunks. Which gives jam a smoother consistency than preserves. The fruit juice is then boiled in lemon juice and sugar, adding additional pectin. 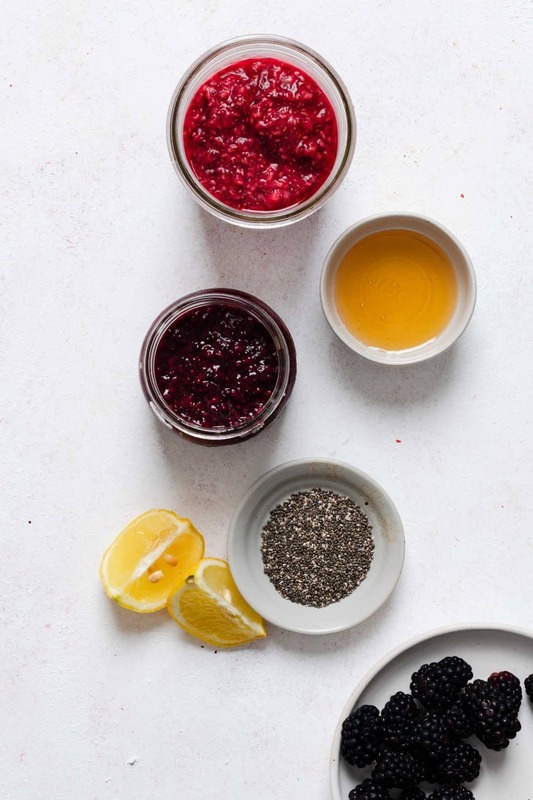 Fruit Preserves are more coarse in texture by keeping the smashed whole fruit and seeds. Often preserves are only boiled in sugar, preventing the fruit from jelling. The addition of acid from the lemon juice helps the jam or preserves thicken. Store your homemade fruit preserves in an air tight container in the fridge. Stays fresh in the fridge for one week. Frozen fruit can be substituted for fresh berries. Make dough and set in the fridge. Make fruit preserves and let cool. Roll out half of the dough and cut with large linzer cookie cutter, then bake. 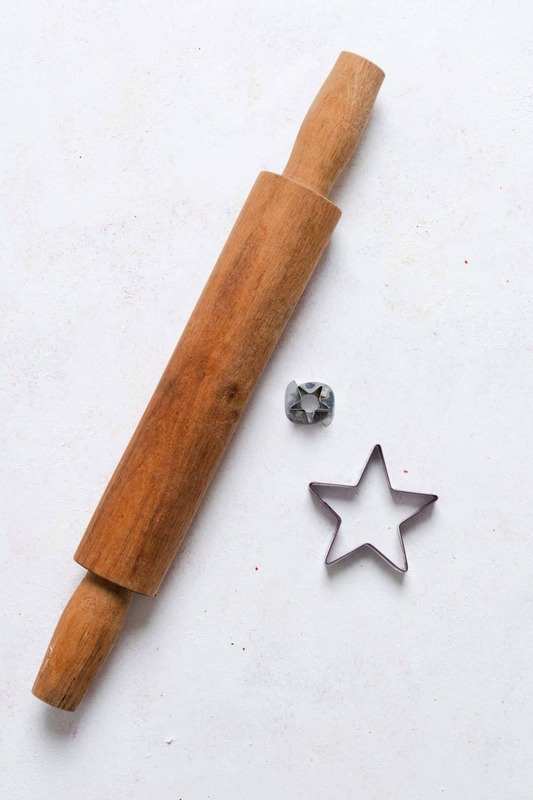 Roll out second half of dough and cut with both large and small linzer cookie cutters. Let all cookies and preserves cool. Dust top cookies without center lightly with powdered sugar. Place a teaspoon or small dollup of fruit preserves in the center of solid base cookies. Gently press top cookie onto base, letting fruit press through the open center. 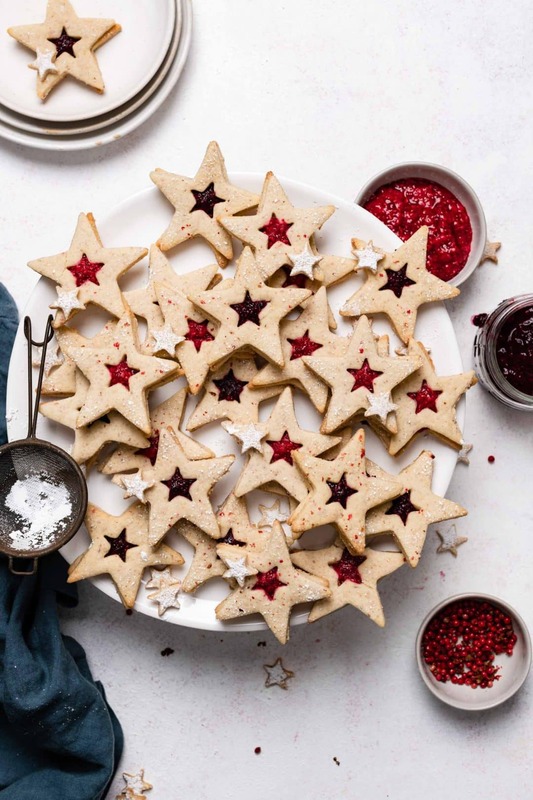 Pink Peppercorn Linzer Cookies can be made into 4th of July cookies by using star cookie cutters. You can also rotate the star to create a firework shape! 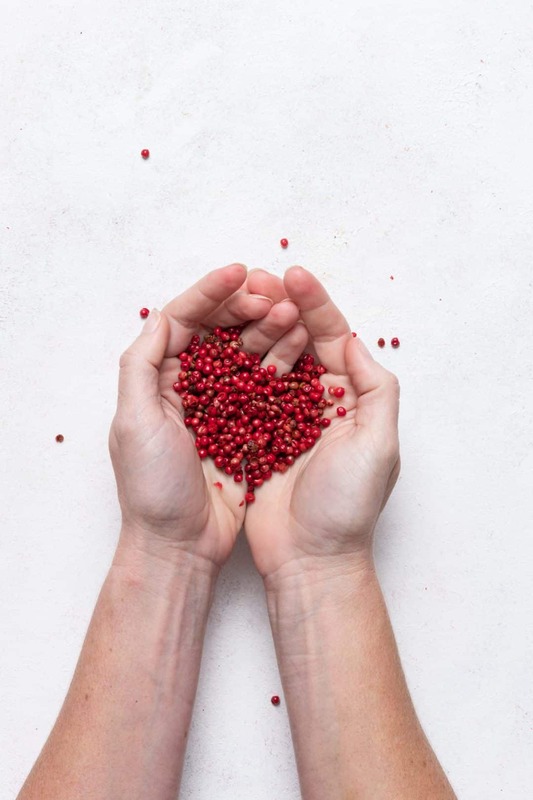 Pink peppercorns are the ripe berries from the Brazilian pepper tree. They have the same size and shape of black peppercorns and are used a spice, due to their light pepper-like taste. 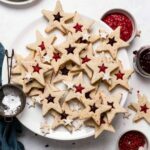 I used pink peppercorns in this recipe to give a little spice to balance the sweetness in this Linzer Cookies Recipe. Just a hint of pepper to ignite my “firework cookies”. Peppercorns graded into smaller pieces work much better than whole ones. I suggest purchasing them already ground or in a grinder. Yes, line an airtight container with parchment paper, place a single layer of cookies down, then another layer of parchment paper, repeating until filled. Frozen cookies will stay fresh for 2-3 months. Fireworks Linzer Cookies Recipe is a perfect 4th of July Dessert. These easy cookies are filled with homemade fruit preserves you can make and eat the same day. 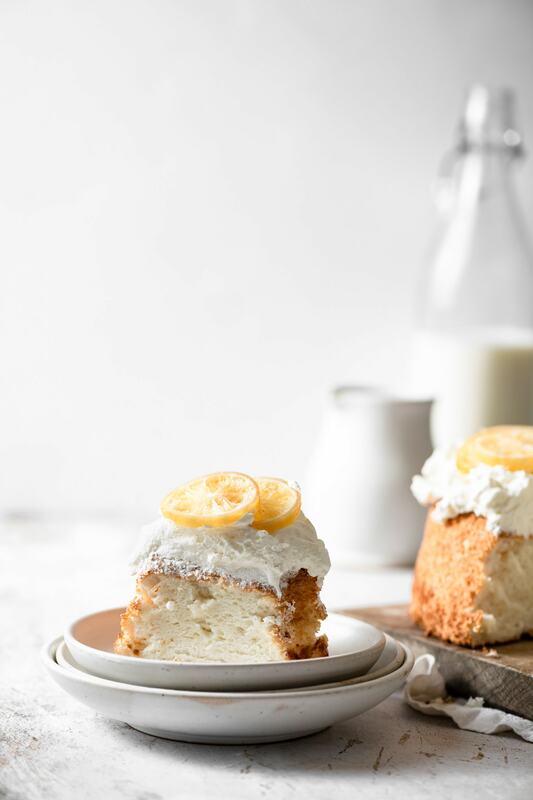 Once you eat a few, they will for sure make your yearly list for 4th of July desserts! Place whole berries and lemon juice in a sauce pan and bring to medium heat. As berries start to breakdown, mash with spoon and stir. DO NOT over heat and scorch your berries. They should bubble slightly but not come to a raging boil. Stir in honey and chia seeds Remove from heat and set aside to cool. 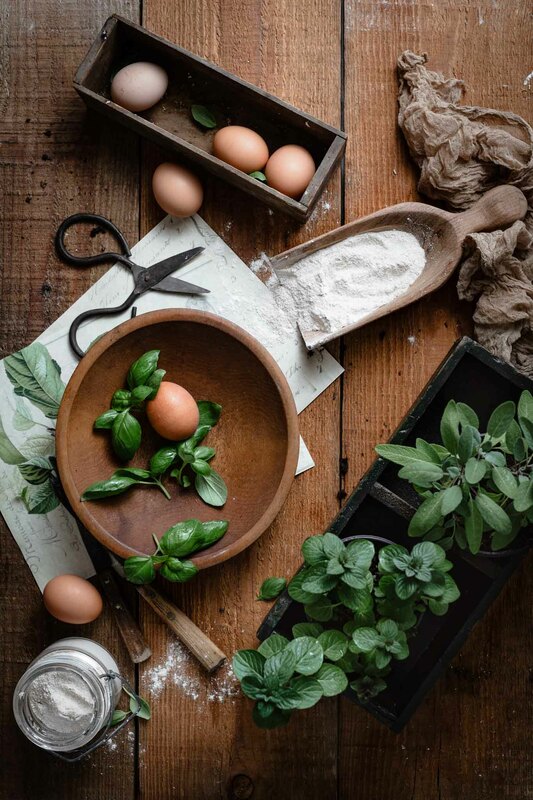 Whisk together flour, almond meal, cinnamon, salt, and pink peppercorns in a small bowl and set aside. Now remove your second half of dough and repeat with large cookie cutter. 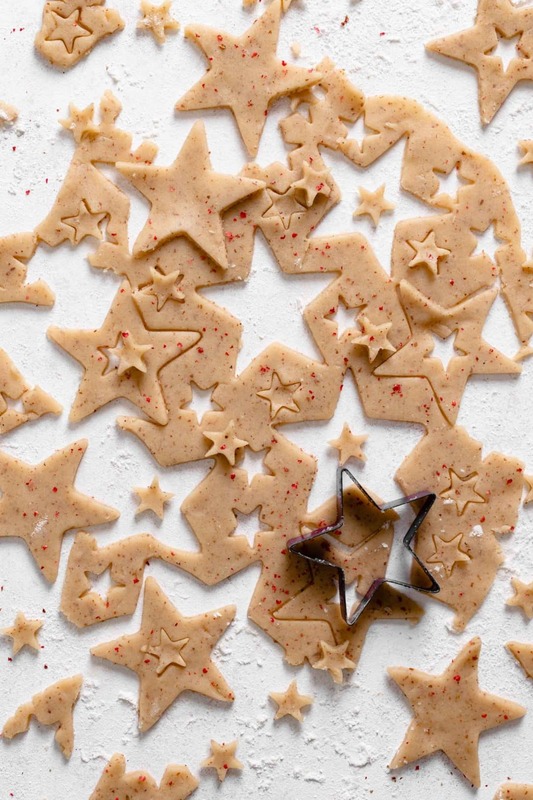 Then take smaller star and cut out the centers of each cookie. 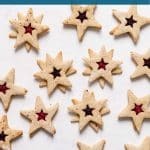 (You can keep the small center stars and make small cookies or add them back to the scraps, roll out and make larger cookies). Spoon a teaspoon of blackberry or raspberry preserves onto the middle of your bottom cookies. Place the top cookie onto the fruit preserves. WOW!! These cookies look amazing. I have only tried pink peppercorns once before and they were so good. This one looks and sounds no different. SO SO well done. Thanks for all the helpful information too. Cheers! Thank you so much for the lovely feedback!! I love pink peppercorns in cookies, especially with the fruit. Never heard of pink peppercorn, can’t believe how cool it made the cookies look! Bravo for the creativity!!! !